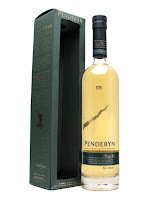 The peat in this Penderyn is not from the spirit, but solely from the casks. I get peat and fresh grass in the smell. A touch of medicine and ashes as well. More peat in the taste. A weird summer like fruity sweetness. It is like it don’t know what kind of whisky it would like to be. Very confusing. The finish dies a bit fast, but the different flavors mixes together a bit better here. A very confusing whisky. A fun experiment, but not that successful. It taste a bit like it is Laphroaig casks they have used, but that doesn’t help much on my final impression on the whisky. It is quality all the way, but the mix of spirit and casks is not very successful in my opinion. I will give this 82/100 (21/21/20/20).